as the thorough biomechanical analysis we provide." Optimise the position on your bike and help you get the right allied professional help, advice and assistance. Why your initial bike fit is crucial? regards to the best fit. We look at your goals, riding history as well as any injury considerations and biomechanical limitations. Being optimised for your ideal riding position and bike. Whether you’re a commuter or racing cyclist, a professional bike fit is an investment in your health. Your bike will be faster and more comfortable – now that’s a win-win. Potential injuries can be avoided if your bike is tailored to your individual needs. 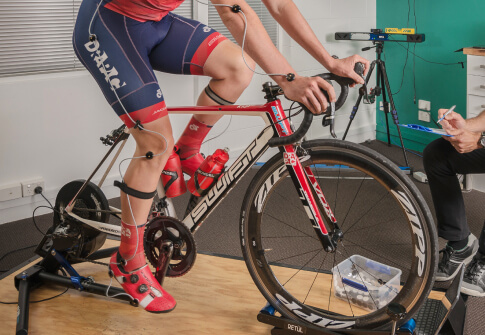 As one of the Brisbane’s most recognised bike fitters, Bike Fit Studio’s uses real-time 2-D and 3-D motion-recording technology to capture data on how you are positioned on your bike. Use our sizing bike to recommend size and contact points for your new bike, whether it is your first bike or an additional one. Once you’ve made yourself at home on your new bike it’s inevitable that you’ll want to make a few adjustments to improve your overall comfort levels. If you have a new pair of shoes or saddle and are experiencing problems or issues, maybe it’s time you had a check-up. Clients who have already had an initial bike fit with Bike Fit Studio and believe their bikes are in need of adjustment or fine tuning. Under the guidance of our specialist team, cyclists can work through their fit on the bike. Coupled with our biomechanical analysis using our Retül 3-D system, we can optimise a rider’s bike fit and ensure maximum efficiency and comfort. 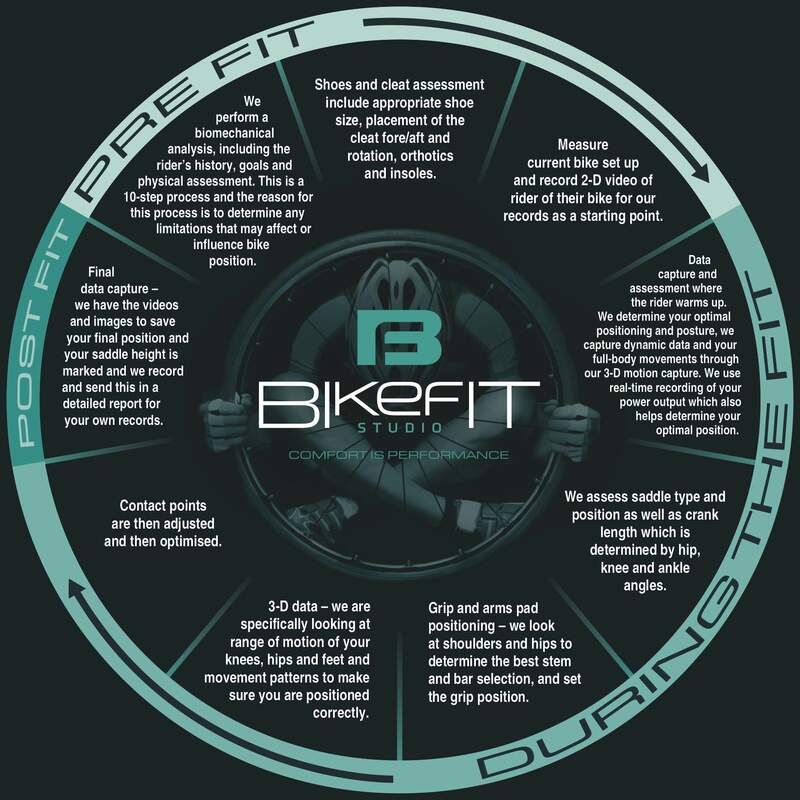 A Fit Review appointment is appropriate for a bike that has been fitted by Bike Fit Studio within the past year, at this time a follow-up visit is recommended for part changes and a reassessment of performance and comfort. 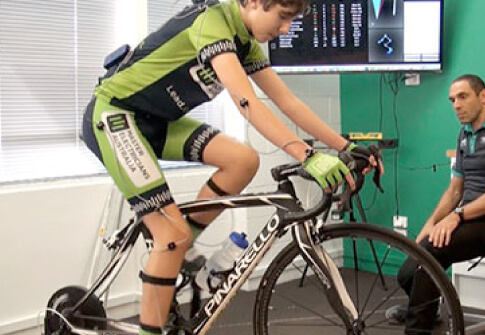 The main aim of bike fit for juniors is to achieve symmetry in the body and ideal biomechanics while riding, achieved by ergonomic optimisation. Incorrect bike-frame sizing will ultimately result in sub-optimal positioning, poor pedalling technique, and inefficient energy expenditure. The right bike fit will ensure that riding in no way hinders or compromises growth and development. Much of a junior bike fit is similar to that for adults, though aspects such safety and comfort and areas such as bar width and crank length have far more impact for kids – and the common practice of purchasing a bike that the child will grow into is sometimes not the answer. It is always important to ensure you have the correctly sized bike, as well as the appropriate bike-fit set-up and advice around when to review your child’s positioning. When recommending a frame size and cycling shoes for juniors, we will always take into account the scope for that extra growth if this happens. How often should you fit your child? Our process is to have an Initial Bike Fit where we start the bike-fitting process. Then given the vast difference of growth rates in children, we suggest keeping an eye on the growth rate (by self-monitoring height) and if there is a growth rate of more than 1.5 cm we suggest a review. Cycling is so good for juniors – for a healthy lifestyle, improved attention and mental health, and physical conditioning – not to mention that it is fun. Ensure your child has a bike fit performed on a regular basis – at minimum once a year – to maximise the effectiveness and comfort, not to mention safety, of this rewarding recreational activity. Put simply, a junior bike fit is your child’s ticket to riding success, and remember comfort is performance. 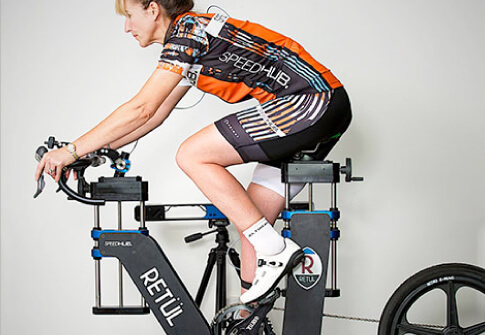 Initial Jnr Bike Fit $199.00, which is a longer consultation that goes for 1.5 hours. Review process, a 30-60 minute consultation and review where we give self-monitoring techniques so you know when to make the next review appointment. You can’t put a price on performance, but you can ensure the bike you buy has the correct frame, saddle, crank length and handlebars to suit your individual body type. Before customers make their final purchase, the Bike Fit Studio team works through specific requirements and consider your personal needs and comfort. The task of selecting a new frame can be daunting; it is often a minefield of questions and endless possibilities. 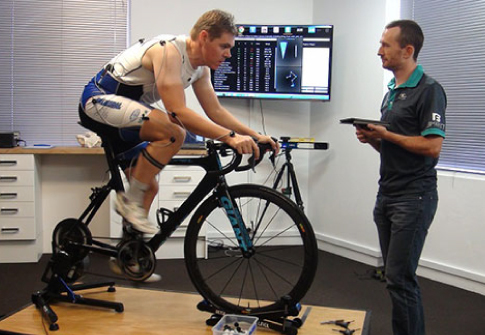 At Bike Fit Studio Brisbane we have a professional and knowledgeable bike-fitting team that will take the stress and difficulty out of this process. Using our experience in all types of cycling and terrain to assist riders in finding the right frame to suit their specific needs. Analysing technical data gained from your previous fitting to come up with a comprehensive range of compatible frame options. Once we have assessed the data compiled from your sessions with us, we can narrow down the number of suitable frames and suggest your perfect match.